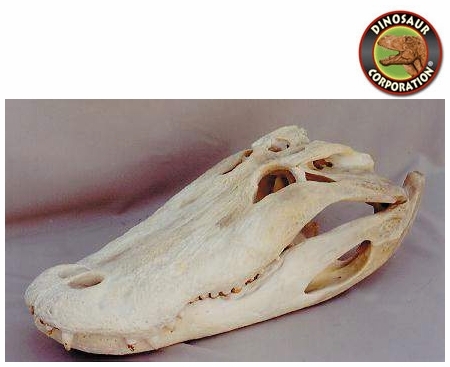 American Alligator Skull. Alligator mississipiensis; S.E. USA marshes, rivers, swamps. The American Alligator (Alligator mississippiensis) is one of the two living species of Alligator, a genus within the family Alligatoridae. The American Alligator is native only to the southeastern United States, where it inhabits wetlands that frequently overlap with human-populated areas. It is larger than the other Alligator species, the Chinese Alligator. The American Alligator has a large, slightly rounded body, with thick limbs, a broad head, and a very powerful tail. Males can weigh 500 lbs to over 1000 pounds. One American Alligator allegedly reached a length of 19 feet, 2 inches (5.8 meters), which would make it the largest recorded. 13 to 14.5 feet (3.94 to 4.39 meters) is a more common adult size. The tail, which accounts for half of the alligator's total length, is primarily used for aquatic propulsion. The tail can also be used as a weapon of defense when an alligator feels threatened. Alligators travel very quickly in water, are generally slow-moving on land and can lunge short distances very quickly. They have five toes in front and four in back.